Question: If a son or daughter wish to get married and, for whatever reason, their parents oppose this marriage proposition, must they obey their parents regarding this matter or not? Answer: We have already established in a previous Halacha approximately three years ago that one is only obligated to honor one’s parents using one’s parents’ money and children are not obligated to spend their own money in order to honor their parents (unless the parents do not have enough money to support themselves). Based on this, the Rabbeinu Yosef Cologne (a school-teacher and one of the foremost Poskim who lived over five-hundred ago in Italy) writes regarding our question of a man who wishes to marry a woman whom he has found to be befitting and his father opposes this marriage prospect staunchly that the son need not heed his father in this matter, for this matter does not directly impact the father’s honor like matters of food, drink, and the like. This is especially true since the father’s order for the son to leave the woman he would like to marry and marry another woman whom he does not find as fitting will cause the son much distress. Furthermore, a son may not heed his father when the father commands him to transgress a Torah law and this scenario is very close to the father telling the son to transgress a Torah law, for our Sages (Kiddushin 41a) said that a man may not marry a woman without first seeing her because they were very concerned that a man should only marry a woman whom he finds to be fitting and wishes to marry. If this is indeed the woman that the son finds suitable, the father does not have the authority to undermine his son’s choice for a marriage partner and the son need not listen to him. The Rama and Maharashdam (Rabbeinu Shmuel di Modena, a foremost Sephardic authority who authored a volume of Responsa and lived in the generation of Maran) rule likewise that if a father commands his son that under no circumstances is he to marry the daughter of so-and-so but the son wishes to marry her since she is fine and upstanding in his eyes, it is obvious that the law is that one may marry the woman who is proper in his eyes and the father’s command poses no hindrance whatsoever. Indeed, he shall merit having worthy children from this woman, for she is an upstanding woman just like any other upstanding Jewish women; were the son to marry another woman whom he does not wish to marry, his children would be sons of a hated woman and shall also be despised by Hashem. The Responsa Mishpat Tzedek (authored by Rabbeinu Meir Melamed, one of the great sages of Salonika, Greece) writes about this matter and states that although the Maharashdam’s case was regarding a son, the same would apply to a daughter, for even a father may not marry off his daughter until she matures and says that she would like to marry so-and-so. Many Poskim rule likewise. 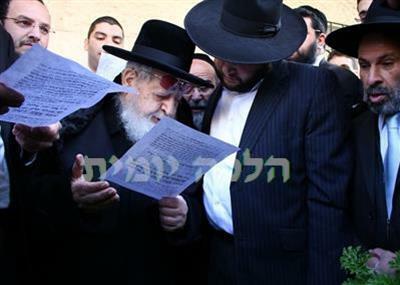 Maran Rabbeinu Ovadia Yosef zt”l rules likewise and he writes lengthily to disprove the opinion that distinguishes between a son and a daughter regarding this law. Although the above represents the Halacha regarding this matter, nevertheless, we must point out that children must act wisely and listen to the advice of their parents in a respectful manner, for marrying a spouse that the parents disapprove of is a very serious matter which can, G-d-forbid, create a permanent rift between the parents and their child. Regarding all such matters, it is correct to seek the advice of a true, experienced Torah scholar in order to ascertain the correct way to behave. Approximately thirty years ago, a family unknown to us opposed the perspective marriage of their daughter to a certain fine, upstanding, and G-d-fearing young man. Although the match seemed appropriate, the parents vehemently disapproved of him and they told their daughter that if she marries this young man, they would disown her and not attend the wedding. Maran zt”l caught wind of the situation and on the afternoon of the wedding day, he showed up by surprise at the home of the bride’s parents and implored them to attend the wedding along with him. Maran zt”l promised that he himself would officiate and grace the wedding with his presence and he heaped copious blessings upon them until the parents finally acquiesced and they attended the wedding to the joy of the couple and all of the guests. Nonetheless, all this applies only when the prospective spouse is a fine, modest woman like all other proper Jewish women; however, if the son wishes to marry an immodest woman from a lowly family and this marriage will cause the father great anguish, the son must obey his father, for his marrying this woman will cause his father shame and suffering and the Torah states, “Cursed is one who denigrates his father and mother.” Similarly, we find that Yitzchak Avinu commanded his son, Yaakov, not to marry a Canaanite woman because they were an evil and sinful people with corrupt character traits. However, if the woman is a fine, upstanding woman, one need not heed his father, as we have mentioned above.